You’ve made the big decision – to remodel your kitchen. Now comes the challenge, where do you begin? Some homeowners collect photos while others start by looking at a single element – appliances, flooring, countertops – they feel will make or break the overall design. 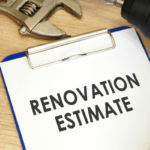 During this stage of exploration, some homeowners decide to do a full gut job, while others determine a simple upgrade is all that is needed. Often at this point, homeowners may find themselves on a long journey to their dream kitchen. 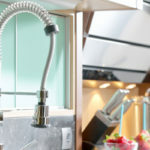 Let’s explore the steps required to achieve successful completion of your home kitchen remodel. This step requires you to prioritize. Ask yourself these questions to begin. How many people use your kitchen? How many people regularly gather there? Do you need more room? Do you need to create a more user-friendly space? What are the absolute must haves for your new kitchen? You get the picture, right? If you aren’t sure what you want, begin collecting photo ideas of what you like (see our previous blog for help). 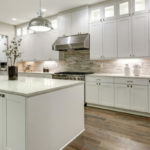 As you ponder what you truly want in your kitchen remodel you see a pattern emerge of what you like, allowing you to move forward with your remodel. Once you are ready to move forward, you’ll want to start with your preliminary budget and the scope of work. The scope of work simply refers to the parameters of your project, be it addition, kitchen upgrade, completely revamped layout, etc. The budget and the scope of work are completely entwined, and both may change multiple times as you make your way through the design process adjusting to meet needs and budget along the way. You will need to work with professionals along the way even if you plan to do some of the work yourself. Some homeowners start with a designer, others with an architect, and others with a contractor. Whomever you choose, remember these professionals can help you with everything, permits, space planning, budgets, contracts, products, finishes, and fixtures, everything you need from beginning to end. In this step, your design and floor plans are finalized, complete with all the technical details needed including mechanical, electrical, elevations, etc. Construction Drawings will be submitted by your architect or contractor for permits. Timing varies in each locality, so be sure to check with yours to ensure you stay on your timeline. At this point, if you don’t have one yet, you will need a licensed contractor to see your project through to completion. He or she can provide estimated costs at this point to ensure you stay on budget. 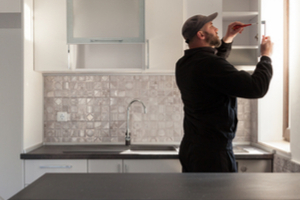 After your permits are in place, you need to clear out of the kitchen space, set up a temporary kitchen if you’re living in during the remodel, or move to your temporary housing if not. Once complete, demo and construction can begin. The punch list comes when construction is nearly complete. You and your contactor will go over any issues, problems, etc. 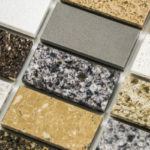 that need to be resolved before your kitchen remodel is declared complete and successful.